These simple takes on roasted potatoes will be at home on any fall or winter table. Add fragrant orange zest to quickly elevate roasted potatoes, and to complement other Thanksgiving dishes. Toss potatoes with a quick, homemade herb salt before roasting. In his Greek take on roasted potatoes, MP Taverna chef and owner Michael Psilakis makes a roasted lemon sauce for tossing with potatoes, capers and herbs. For a more casual-feeling Thanksgiving side, dress roasted potatoes with a mayonnaise-mustard dressing and dill. For saucy potatoes with a punch, roast par-cooked potatoes in a sweet chipotle dressing, then toss with yogurt. If you like the kick but not the creamy sauce, try roasting potatoes with jalapeños. 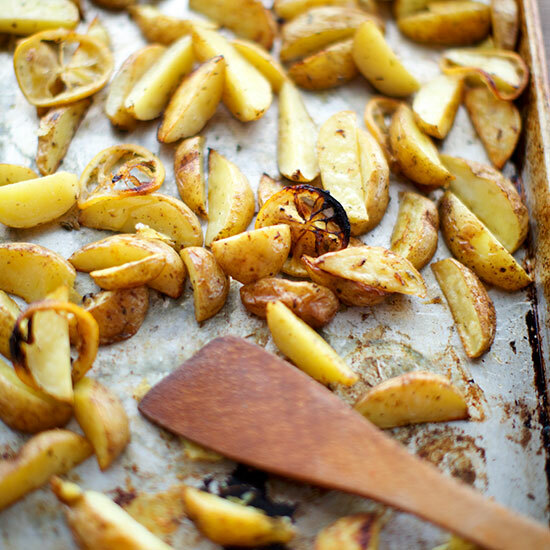 Roast potatoes with whole lemon slices for a dish that looks as good as it tastes.